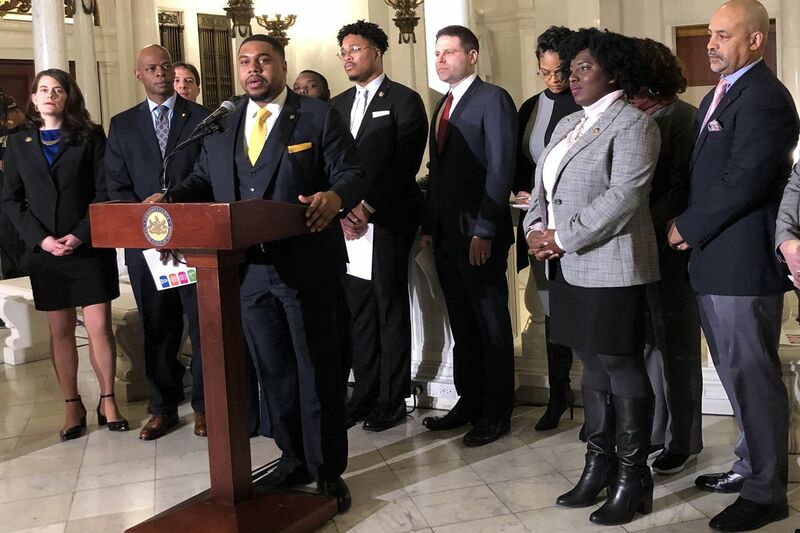 Rep. Jason Dawkins (D., Philadelphia) was at the podium last month when Philadelphia's delegation to the Pennsylvania House unveiled their legislative priorities for the new session. Democratic State Rep. Jason Dawkins lives on Lesher Street in Frankford in the rowhouse where he grew up. When he was 13, an older brother was shot and killed. Dawkins went on to graduate from Frankford High, took courses at Penn State Abington and Community College of Philadelphia, then moved to Atlanta to stay with relatives while applying to another college. One of those relatives was also shot to death. Gun safety after Parkland: Here's every idea the Pa. House has. Will any become reality? So Dawkins didn’t get a college degree. He got an education in the tragedies of urban life. He also worked for his grandfather, the late William “Billy” Gambrel, who as cofounder of youth football’s famed Frankford Chargers had coached and mentored at-risk kids for a lifetime — and in 2007 became the city’s first living African American to have a community rec center named in his honor. Gambrel, who died in 2016, was “instrumental in my development as a person, especially in terms of self-respect and respect for the community," Dawkins said. Dawkins worked for seven years as an aide to City Councilwoman Maria Quinones-Sanchez. He first won election to the state House in 2014, without the support of either his party or labor. Now, at 34, he’s part of a new, mostly younger group of city legislators pushing for change in Harrisburg. He recently was elected by them to chair the city’s House delegation. The delegation includes 24 Democrats (there’s currently a vacancy to be filled by a special election in March) and two Republicans, Northeast Philly Rep. Martina White and (technically) Rep. Thomas Murt, who represents a small portion of Fox Chase but whose district is mostly in Montgomery County. The Inquirer spoke with Dawkins about his life and his new delegation gig. What’s the biggest challenge you and an urban Democratic delegation face in a Republican-run legislature in a largely rural and suburban state? The biggest challenge is dealing with the non-experience — that so many members may not understand the other side. It can be unexplainable, like post-traumatic stress syndrome, unless you live it. Most of my city colleagues know what it’s like to leave their homes and be afraid, be traumatized every day by the crime, addiction, poverty in this city, especially in comparison to other parts of the state. There are plenty of places suffering from low wages, but there’s a difference. There’s the density here, a 26 percent poverty rate, 400,000 people living in poverty. In some of our members’ districts, the poverty rate is 50 percent or more. So, it’s an uphill battle. The delegation recently released its “Philadelphia Platform,” a comprehensive policy plan aimed at fighting persistent poverty. It’s very broad. Is there a specific starting point? The most immediate starting point is how do we get people into jobs without needing special training? We’re looking to pair jobs with the skill sets available. This isn’t always driven through policy. We’re working with the chamber (the Chamber of Commerce of Greater Philadelphia) to identify unfilled jobs. … And we’re especially working to get more paid apprenticeships. But if you could pick one piece of policy, one piece of legislation to get enacted right now, what would it be? Increasing the ($7.25 an hour) minimum wage. And I would move a bill not tied to a dollar amount but tied to the cost of living, because with a cost-of-living index our minimum wage today would be $21 an hour. I don’t want to keep coming back and asking for a dollar-amount increase. What do you consider your most important contribution to public service so far? The movement around ending life imprisonment without parole. It was the first bill I introduced, back in 2015. It’s controversial. Most of my colleagues thought because of it I’d be primaried and lose my seat. It changed my life. It addresses a population written off as scum or menaces. I believe in redemption. I believe in forgiveness. Because I lost a brother to gun violence, I know that for my own personal growth I had to forgive his killer, which was extremely hard to do. But there are people serving life who didn’t kill anyone, who were accessories, or who didn’t understand the legal system when pleading to specific crimes. I’ve been verbally abused over this many, many times. But people are starting to look at criminal justice through a different lens, including the cost of aging inmates. I believe this current session will produce progress on this issue. Your platform has no price tag but clearly calls for increased spending. How do you overcome perceptions among many taxpayers and many of your GOP colleagues that such spending is often ineffective and wasteful? One way to combat that is to bring folks to the city. Take them to advocacy groups who work on the ground so they can see what we deal with. Most of my GOP colleagues were firmly against (ending) life without parole until they went to the prisons and talked to inmates. Yes, there’s lots of fraud, but everything we’re doing is based on need. And we need to show some people what it means to be bad off, give them a reality check on why this or that program makes sense. The legislature doesn’t have a reputation for backing progressive ideas. And its overall image is less than stellar. How have you found it? When I first got here, I noticed it had this cloud. And I read the newspapers like everyone else — about scandals, inaction, allegiances to special interests. But I ran to serve and get things done. … I ran against the party, ran against the unions. I won by 64 votes. So, my loyalty is solely to the people who sent me here. And there are more like me. I think it’s changing. In the past, there were people who didn’t have to work hard to get here and didn’t value the space the same way I value the space. Every session brings calls for reforms, in voting laws, redistricting, campaign finance. What one reform do you think would improve our politics? It would have to be campaign-finance reform, followed by redistricting. … In parts of the state, money’s the only thing that gets you elected. PACs are convenient, and they have and spend way too much money on elections. … And corruption breeds in places of convenience.